Beetles and their larvae are among the most serious pests of gardens, as these insects will feed on a great number of plants. Identification of beetle garden pests comes through studying the insect closely. Features such as the bug's size, the changes it goes through as it turns into an adult from its egg state, coloration, the host plant, and the damage the beetle does will all help you recognize a particular species. Size is one aspect that you can use to establish what type of beetle wreaks havoc in your garden, but it is by no means the major distinguishing factor. Most garden beetles are in a somewhat similar size range, which limits the effectiveness of employing size solely as a method to identify one. For example, beetles such as the striped cucumber beetle are 1/5 inch long, while the spotted cucumber beetle is the same length. Great differences can occur between the larval stage of a garden beetle and the adult stage. The Colorado potato beetle is a case in point, as its larvae are reddish and possess two rows of spots on their sides. These fat larvae eventually change into the adult, which is ¼ inch shorter, has yellow and black coloring, and features five stripes on each of its thickened forewings known as elytron. Some garden pest beetles have vivid colors in their adult form that can help you recognize them. One is the Japanese beetle, a species that has a metallic green color along with copper-shaded wing coverings. The Japanese beetle also has five telltale white patches of minute hairs on both sides of its abdomen and two on its end segment. The red turnip beetle is another colorful beetle, with alternating red-and-black striping on its body. The spotted asparagus beetle has an orange body highlighted by black spots. While many types of beetles will make a meal of a variety of garden plants, some have an affinity for certain kinds. This can be an aid when it comes to identifying the bug. Beetles such as the striped cucumber beetle will tend to eat pumpkins, squash, melons and cucumbers, according to the University of Minnesota Extension website. The bean leaf beetle prefers soybean and snap beans. 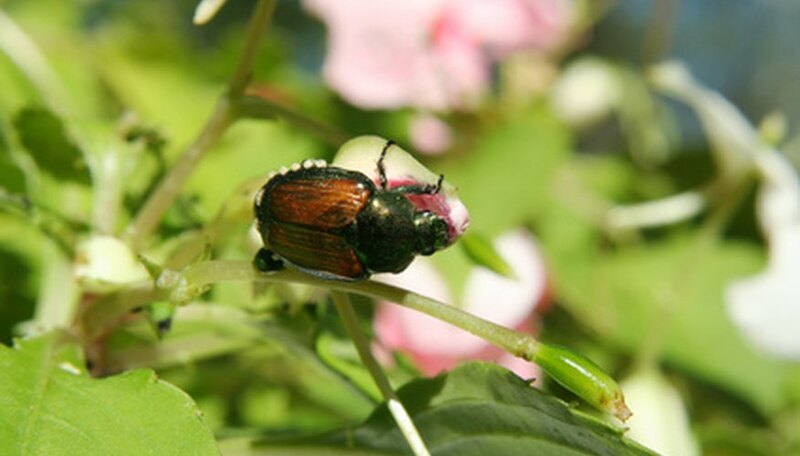 Other beetles are not so fussy; the Japanese beetle will feed on as many as 300 different plants, making this aspect of identification useless for that species. You can sometimes complete your identification of a beetle by examining the plant it was on and surveying the damage it has done. The tiny flea beetle will precipitate wilting of leaves and stunt the growth of garden plants such as cabbage, potatoes and corn. The spotted asparagus beetle chews on the shoots of asparagus early in the year. Japanese beetles can skeletonize leaves, according to the University of Florida Institute of Food and Agricultural Sciences site.